Some Biblical scholars claim that a remarkable stone tablet never before shown on film appears to settle that the Tower of Babel really existed. There may be no doubt that Nebuchadnezzar II built a ziggurat, but that does not prove it is not the tower of Babel. It does provide an explanation why the world’s peoples speak different languages. Gustave Doré’s interpretation of the confusion of tongues. Babel (Babylon) is described as founded by Nimrod along with Uruk, Akkad and perhaps Calneh—all of them in Shinar. Babylon was a major kingdom on the Euphrates river in ancient Mesopotamia from the 18th to 6th centuries BCE. The city was built in equal parts along the left and right banks. 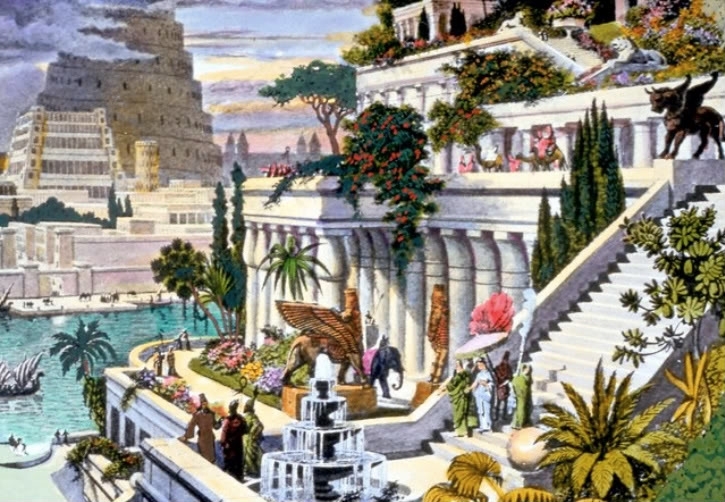 Babylon was known as the site of one of the Seven Wonders of the Ancient World: the Hanging Gardens . The Great Pyramid of Giza, the oldest of the ancient wonders, remains relatively intact. The Colossus of Rhodes, the Lighthouse of Alexandria, the Mausoleum at Halicarnassus, the Temple of Artemis and the Statue of Zeus were all destroyed. The location and ultimate fate of the Hanging Gardens are unknown, and there is speculation that they may not have existed at all. The most immediate threat to the ruins of Babylon is water soaking the ground. The ground is saturated just below the surface at sites of the Ishtar Gate and the long-gone Hanging Gardens. Bricks are crumbling, temples collapsing. The Tower of Babel, long since reduced to rubble, is surrounded by standing water. A ziggurat (Akkadian: ziqqurat “to build on a raised area”) is a type of massive stone structure built in ancient Mesopotamia. It has the form of a terraced compound of successively receding stories or levels. The Mesopotamians believed that these pyramid temples connected heaven and earth. 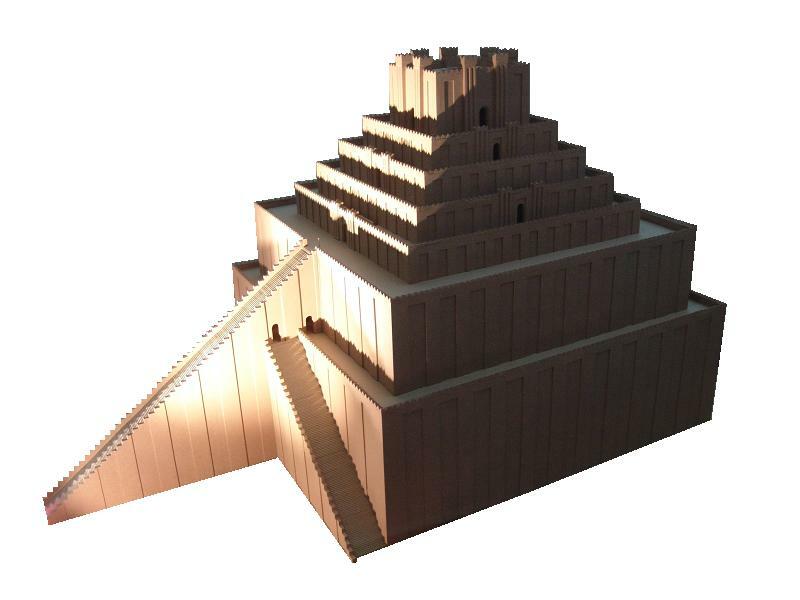 In fact, the ziggurat at Babylon was known as Etemenankia or “House of the Platform between Heaven and Earth”. Plane of the religious complex, with the Etemenanki. 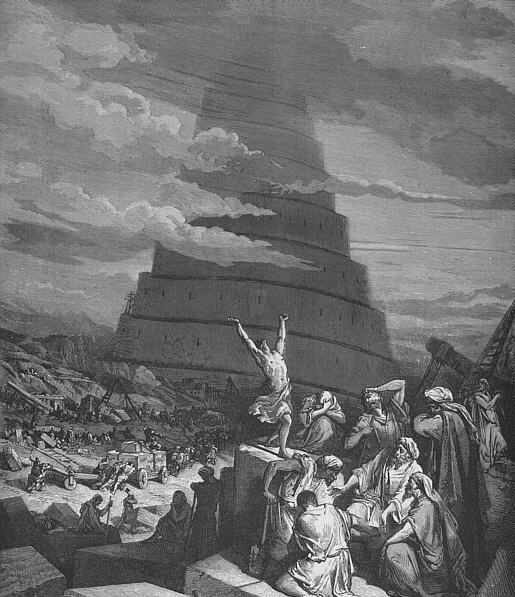 Some modern scholars have associated the Tower of Babel with known structures, notably the Etemenanki, a ziggurat dedicated to the Mesopotamian god Marduk by Nabopolassar and Nebuchadnezzar II circa 610 BCE. Of its original seven storeys today, little more than the foundations are preserved, which appear in the satellite image as a dark square with 90 meters side length. Jeff Allen is the Program Director of the World Monuments Fund. He deals mainly with projects partnering World Monuments Fund with U.S. State Department Ambassadors Fund for Culture Preservation assistance. He has worked in the field for 15 years on a number of projects in the Middle East and Asia. Now the whole earth had one language and the same words. 2 And as people migrated from the east, they found a plain in the land of Shinar and settled there.3 And they said to one another, “Come, let us make bricks, and burn them thoroughly.” And they had brick for stone, and bitumen for mortar. 4 Then they said, “Come, let us build ourselves a city and a tower with its top in the heavens, and let us make a name for ourselves, lest we be dispersed over the face of the whole earth.” 5 And the Lord came down to see the city and the tower, which the children of man had built. 6 And the Lord said, “Behold, they are one people, and they have all one language, and this is only the beginning of what they will do. And nothing that they propose to do will now be impossible for them. 7 Come, let us go down and there confuse their language, so that they may not understand one another’s speech.” 8 So the Lord dispersed them from there over the face of all the earth, and they left off building the city. 9 Therefore its name was called Babel, because there the Lord confused[a] the language of all the earth. And from there the Lord dispersed them over the face of all the earth. According to the Bible, the generations following the Great Flood, speaking a single language and migrating eastward, comes to the land of Shinar (שִׁנְעָר‬). There they agree to build a city and a tower tall enough to reach heaven. The Bible does not specifically mention that Nimrod ordered the building of the tower, but many other sources have associated its construction with Nimrod. God, observing their city and tower, confounds their speech so that they can no longer understand each other, and scatters them around the world. 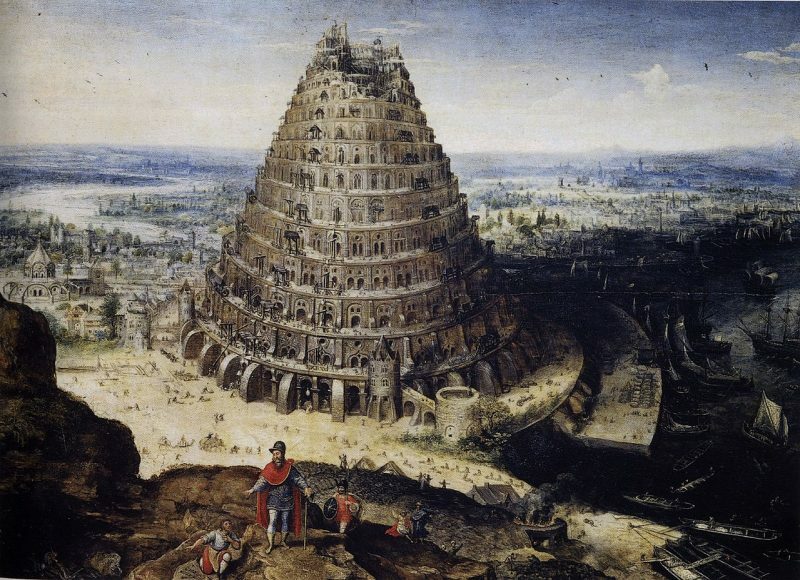 The phrase “Tower of Babel” does not appear in the Bible. 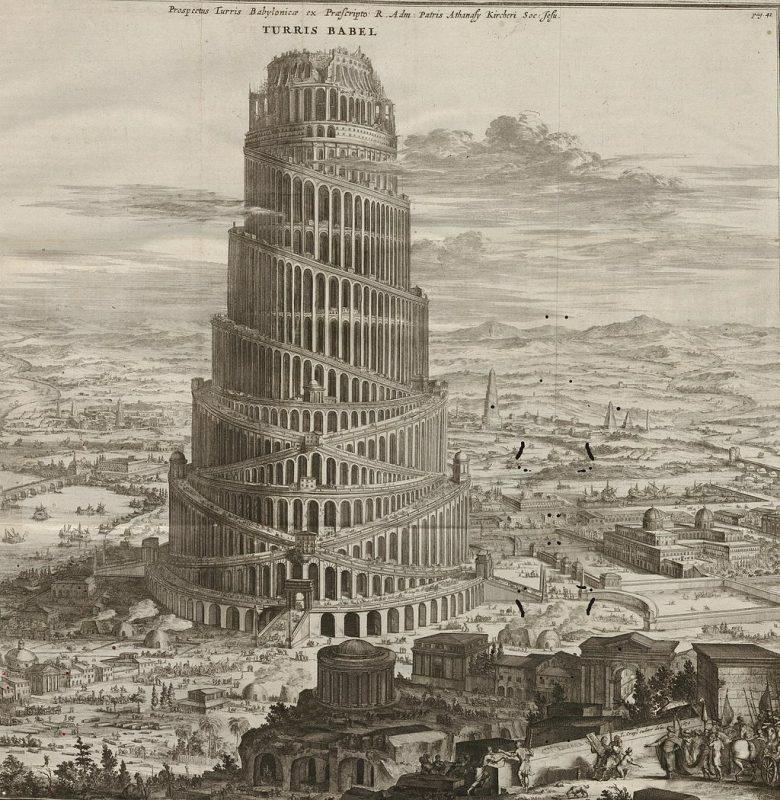 According to the Bible, the city received the name “Babel” from the Hebrew word balal, meaning to jumble or to confuse. Maquette 3D proposant une reconstitution de la ziggurat Etemenanki de Babylone, Pergamon Museum.